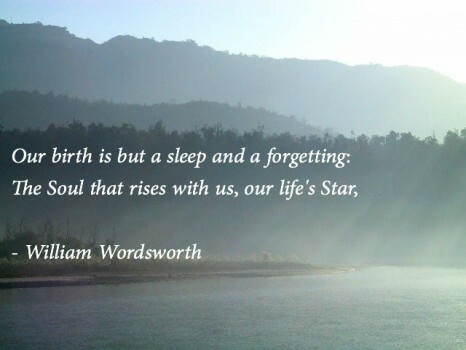 William Wordsworth (1770-1850). British Romantic poet from Grasmere, Lake District. Wordsworth encapsulated man’s mystic relationship with nature. WORDSWORTH, WILLIAM (1770-1850) born at Cockermouth. His boyhood was full of adventure among the hills, and he says of himself that he showed “a stiff, moody, and violent temper.” He lost his mother when he was 8, and his father in 1783 when he was 13. The latter, prematurely cut off, left little for the support of his family of four sons and a daughter, Dorothy (afterwards the worthy companion of her illustrious brother). With the help however, of uncles, the family were well educated and started in life. William received his earlier education at Penrith and Hawkshead in Lancashire; and in 1787 went to St. John’s Coll., Cambridge, where he graduated B.A. in 1791. His uncles were desirous that he should enter the Church, but to this he was unconquerable averse; and indeed his marked indisposition to adopt any regular employment led to their taking not natural offence. The beginning of his friendship with Coleridge in 1795 tended to confirm him in his resolution to devote himself to poetry; and a legacy of £900 from a friend put it in his power to do so by making him for a time independent of other employment. He settled with his sister at Racedown, Dorsetshire, and shortly afterwards removed to Alfoxden, in the Quantock Hills, to be near Coleridge, who was then living at Nether Stowey in the same neighbourhood. One result of the intimacy thus established was the planning of a joint work, ‘Lyrical Ballads’, to which Coleridge contributed ‘The Ancient Mariner’,and Wordsworth, among other pieces, ‘Tintern Abbey’. The first edition of the work appeared in 1798. With the profits of this he went, accompanied by his sister and Coleridge, to Germany, where he lived chiefly at Goslar, and where he began the ‘Prelude’, a poem descriptive of the development of his own mind. After over a year’s absence Wordsworth returned and settled with Dorothy at Grasmere. Two years later Wordsworth’s circumstances enabled him to marry his cousin, Mary Hutchinson, to whom he had been long attached. In 1804 he made a tour in Scotland, and began his friendship with Scott. The year 1807 saw the publication of ‘Poems in Two Volumes’, which contains much of his best work, including the “Ode to Duty,” ” Intimations of Immortality,” “Yarrow Unvisited,” and the “Solitary Reaper.” In 1813 he migrated to Rydal Mount, his home for the rest of his life; and in the same year he received, through the influence of Lord Lonsdale, the appointment of Distributor of Stamps for Westmoreland, with a salary of £400. 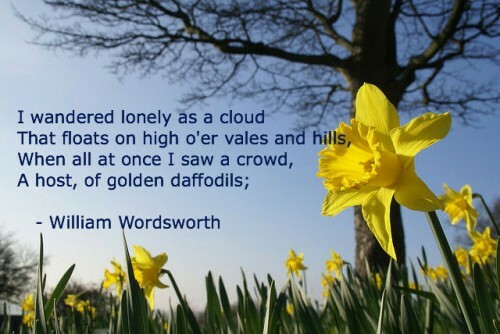 Wordsworth had now come to his own, and was regarded by the great majority of the lovers of poetry as, notwithstanding certain limitations and flaws, a truly great and original poet. In 1843, he succeeded Southey as Poet Laureate. His long, tranquil, and fruitful life ended in 1850. He lies buried in the churchyard of Grasmere. The work of Wordsworth is singularly unequal. When at his best, as in the “Intimations of Immortality,” “Laodamia,” some passages in ‘The Excursion’, and some of his short pieces, and especially his sonnets, he rises to heights of noble inspiration and splendour of language rarely equalled by any of our poets. But it required his poetic fire to be at fusing point to enable him to burst through his natural tendency to prolixity and even dullness. He has a marvellous felicity of phrase, an unrivalled power of describing natural appearances and effects, and the most ennobling views of life and duty. But his great distinguishing characteristic is his sense of the mystic relations between man and nature. His influence on contemporary and succeeding thought and literature has been profound and lasting. It should be added that Wordsworth, like Milton, with whom he had many points in common, was the master of a noble and expressive prose style.